Scotland scores again. 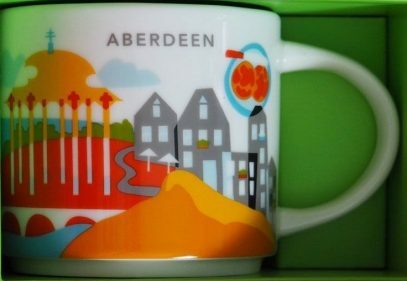 Welcome the new mug from You Are Here series – Aberdeen. This city is only third by population in Scotland, yet it now has YAH and Glasgow doesn’t. Don’t forget, Edinburgh has been released long time ago too. Hey, Starbucks, what is your logic? It’s not like I am complaining, just trying to understand you. As for the mug itself, I would like to mention Aberdeen Beach and Queens Links which is famous for it’s golden sand. Unfortunately it suffers from erosion and multiple actions are performed in order to protect it.